Warner Bros., he'd been the one to put the finishing touches on Bugs Bunny — the Rabbit wasn't quite "Bugs" until Avery got hold of him — and had created Daffy Duck from scratch. Naturally, he wanted to repeat that success for his new bosses. And he did create hits there — Droopy is still seen today on Cartoon Network; and Droopy's wolfish adversary, also seen in Red Hot Riding Hood and its sequels, was a star in his own right. But when Avery tried to do another character in the Bugs/Daffy tradition — well, perhaps he was trying too hard. Screwy Squirrel is a terrific vehicle for gags, but just too anarchic, too whacky, with too few redeeming characteristics, to engage audiences over the long haul. Screwball Squirrel first appeared on April Fool's day, 1944, in a cartoon titled, simply, Screwball Squirrel. It was strictly a gag vehicle — Screwy gets a chase going with a dog, just for the purpose of having a chase. And that's pretty much how it went for five cartoons, which came out over the next couple of years — lots of chasing, lots of gags — and good ones. But if you want to know why he acts the way he does, well, he's crazy. That explains everything. In Lonesome Lenny (1946), Screwy tops himself by shooting himself dead at the end — and to drive the point home, his lifeless carcass holds up a sign, reading, "Sad, isn't it?" This wouldn't be a problem to most toons, who have good reason not to take death very seriously, but, as in the case of a similar act on the part of George & Junior, this happened to be the last cartoon in his series. So in his case it might have been reasonably permanent. Of course, no damage to a toon is more than "reasonably" permanent. Screwy continued to appear in the back pages of Dell's Our Gang Comics, which featured such MGM characters as Barney Bear and Tom & Jerry, although he was eventually crowded out. There, his name was often given as "Skrewy the Skrewball Squirrel". 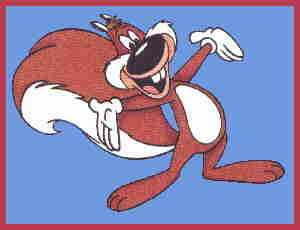 In the mid-1990s, as "Screwball Squirrel", he was revived both in cartoons (as a back-up character in the Saturday morning TV show Droopy, Master Detective) and comic books (when Dark Horse Comics did a three-issue series of his adventures, as well as featuring him in other comics based on Tex Avery's work at MGM). Screwy's most recent atrocity occurred on April 1, 1997, when, in an attempt to get April Fool's Day declared a national holiday, he barricaded himself in the control room of Cartoon Network and ran his second cartoon, Happy Go Nutty (1944), over and over, for twelve solid hours. Text ©2000-10 Donald D. Markstein. Art © MGM.